Potatoes are as durable as they are versatile. Storing potatoes in an open container allows air to circulate around, helping prevent premature aging. Keep potatoes in your pantry or a dark place that is cool, dry and dark. Most varieties will keep for a month, though new potatoes should be used within one week. 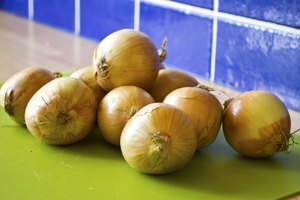 Keep them out of the refrigerator to keep their natural starches from turning to sugar, and don't store them near apples or onions, which release gasses that encourage spoilage. The fresher your potatoes are when you bring them home, the longer they will last. The color of the skin makes no difference as to safe storage, but the type of potato does. 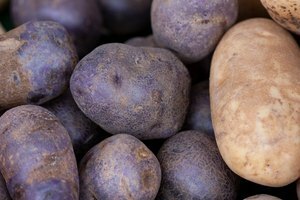 New potatoes of all colors are simply potatoes harvested before they were allowed to reach full maturity. Their skins are generally thin and smooth, and when fresh, should contain no blemishes. All-purpose and baking potatoes tend to be much larger and have thicker skins. All types of potatoes should be firm, and show no cuts, bruises or sprouts. It's best to buy individual potatoes instead of pre-bagged ones so you can inspect each individual tuber for blemishes. Potato skin shows its age much the way human skin does -- it wrinkles, sags and develops spots. While these are hard-earned indications of a life well-lived in people, with images of bad potatoes they are warning signs. A little bit of aging won't change the taste of potatoes too much, but it's best to discard potatoes that have wrinkly, sagging skin and a mushy feel, or if you find potatoes wet in the bag. Fresh potatoes have an earthy, starchy scent. 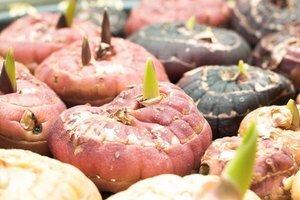 When they start to go bad, this scent changes, becoming bitter and moldy. Sometimes potatoes will look acceptable on the outside but have turned rotten on the inside. If you come across a potato in the supermarket that looks fine but smells wrong, don't purchase it. If the same thing happens at home, simply cut it open to see if the spoiled spot is small enough to be cut out and discarded, or if the whole potato must go. One bad spot doesn't mean you have to throw away the whole potato; it's perfectly safe to each the unblemished part if it shows no dark spots. Simply cut the potato into smaller parts to inspect its interior for the first signs of spoilage. 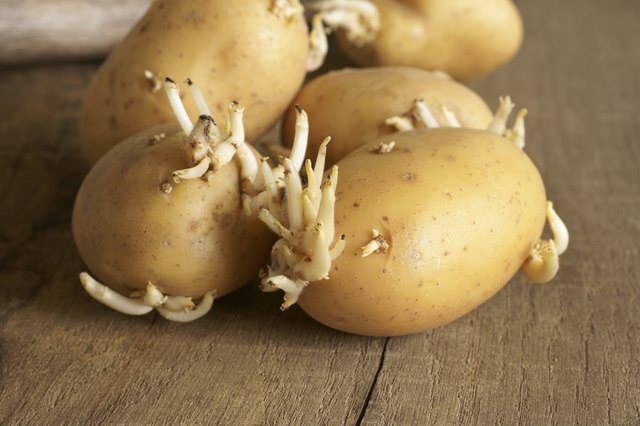 Potatoes do not become completely inert after being harvested, so they often develop little sprouts, called eyes. This is especially true of organically grown or farm stand potatoes, because many mass-produced supermarket potatoes are treated with a chemical that retards sprouting. Remove small sprouts before cooking the potato if it looks and smells fresh otherwise. Potatoes with long sprouts along with other signs of aging should be discarded. Green spots develop just before sprouts appear. These spots contain a mild toxin, so small ones can be cut away, while a potato with large areas of green should be discarded. 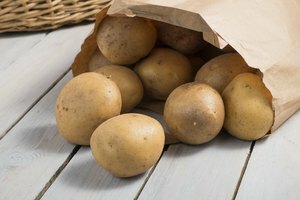 University of the District of Columbia, Center for Nutrition, Diet and Health: What's So Great About Potatoes?